Have you hear of Joy the Baker? We've heard she has some really great recipes, so we decided to try a few out. 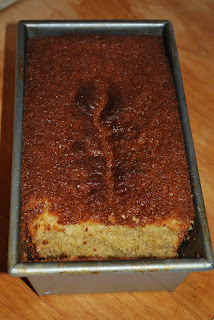 We started with her Honey Whole Wheat Pound Cake (for the recipe click here). We thought it would be a great recipe to use Joseph's Grainery Soft White Wheat with. We ground the wheat berries in our blender to a very fine consistency, what you'd consider stone ground flour. It probably took the blender about 4 minutes for each cup of wheat. It looks pretty good, doesn't it? It tasted pretty good too, but we had a problem...there's a reason the loaf is still in the bread pan. It was super crumbly. So we've learned a lesson, there are a few things that your blender can't do. Unfortunately, for this recipe you'll probably want to have mill of some sort, so you can grind the wheat to an even finer consistency.